“Gospel Blues,” a musical about faith, a chance encounter with Martin Luther King Jr., and a perceived tension between the two musical genres referenced in the title, will be performed at a staged reading this weekend at two Portland churches. Portland playwright Wayne Harrel, who wrote the book and lyrics for the show, said he started working on the play 20 years ago. He grew up in the church, played in a high school jazz band and started listening to the blues in college. An overheard statement – “Christians got no business singing the blues” – got him thinking. Then it got him writing. He reached out to pianist and composer Janice Scroggins and vocalist Linda Hornbuckle for help bringing his idea to life. He wanted to create a musical that was rooted in the music itself, with the story following. 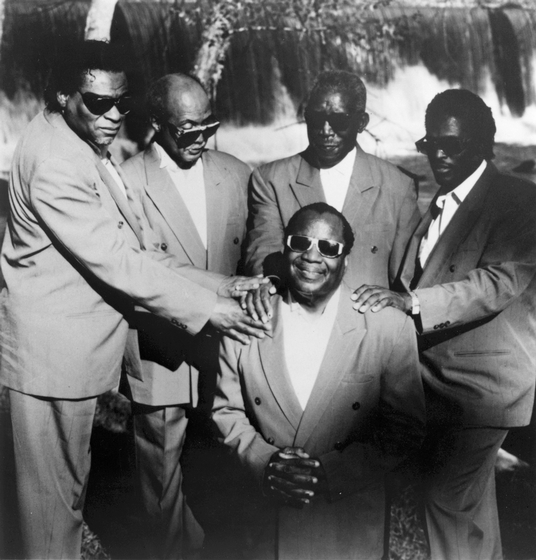 Clarence Fountain and the Blind Boys, Photograph by Michael P. Smith, Courtesy National Endowment for the ArtsThe story focuses on a character named Clarence – a nod to the late gospel singer Clarence Fountain of Blind Boys of Alabama – who sings and works as a sanitation worker in Memphis in 1968. Hazardous conditions for sanitation workers, many of whom were Black and shut out of more lucrative jobs, such as driving garbage trucks, eventually led to the now historic sanitation workers strike, which got the attention of the the Rev. Martin Luther King Jr.
King had been a champion of labor rights; by 1968 his attention was on a broad-sweeping Poor People’s Campaign and on antiwar organizing. But he came back to address Memphis strikers, delivering the famous “I’ve Been to the Mountaintop” address, which was his last: the following day, King was killed. In the play, for which Harrel drew heavily from archival materials at the Memphis Public Library, the lead character – a gospel singer – has the chance to perform for King during his final visit to Memphis. It is King’s death that draws Clarence to the blues. “It’s been a blast,” said Harrel of working on the project, which features Alonzo Chadwick and Saeeda Wright in lead roles. The hope was to produce the show in April of this year, in honor of the 50th anniversary of King’s assassination, but neither Harrel and Chadwick were able to go forward at that time due to personal and medical issues. And in a bittersweet coda, two of Harrel’s collaborators didn’t live to see the play to fruition: Scroggins died in June 2014 and Hornbuckle passed away that October. Harrel has invited local theaters to this weekend’s readings and hopes the work will be produced as a full-stage play in the near future. The play opens at 7:30 p.m. Friday at West Hills Covenant Church, and will be performed again at 7:30 p.m. Saturday at Maranatha Church in Northeast Portland. For more information, including ticket information, visit gospelbluesmusical.com.